Black and pink are the author's favourite colors for both summer and winter steelhead fly fishing. The successful steelheader is a hunter of fish, an angler that has learned to read and interpret the signs of the river to locate that ultimate aquatic prey. For those flyfishers who are new to summer and winter steelhead fly fishing, they must realize that they will face a completely new set of factors compared to those used when fly fishing for resident feeding trout. The first and the most important difference is the fact that steelhead are anadromous trout that do not feed when they return to the river to spawn! Why then do they strike at a fly? The only acceptable answer appears to be because they are what they are, rainbow trout . Yes, some summer steelhead will apparently feed, and, yes, during warm spring rains some winter steelhead will take worms. But, this is not the feeding we associate with the daily activity of resident river trout. Rather, it is the associated behaviour of the species! Steelhead strike because they are what they are, Onchorynchus mykiss, rainbow trout! It is for this reason that both inland and anadromous rainbow trout have been transplanted to locations throughout the world. They are the classic freshwater sporting salmon! Playing steelhead is often a �wild� experience; add another angler also with a hooked steelhead in the same pool and you never know what will happen. For those who wish to pursue specifics, there are numerous. physiological reason for this non-feeding behaviour on the part of anadromous steelhead. The most obvious is that when they return to spawn, their stomach shrinks to provide space in the body cavity for the female and male roe. This does alter their body chemistry to inhibit a daily feeding schedule or need. 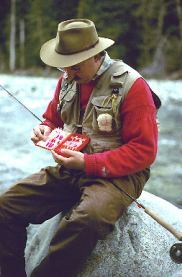 Once the flyfisher has accepted this quantum difference between anadromous salmon and trout, those fish that journey to the sea and return only to spawn, and resident trout, those that remain in their home river throughout their life, then that flyfisher is ready for regular success with the supreme trophy trout, the steelhead. 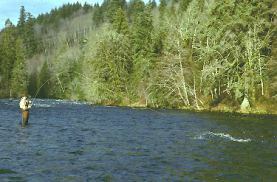 One of the first skills the stream angler learns is the difference between pool types and their resulting holding water for resting steelhead. From my travels and fishing experiences on many streams I would classify stream pools into three main types; "Dogleg," "Crescent," and "Run". The Dogleg Pool is a sharp right or left angled pool, with a 90' angle turn. The Crescent Pool is one with a slow gentle curve usually with a steep bank on one side. The Run Pool is one having a deep depression in the middle but, with the river neither turning right nor left as it flows downstream. Regardless of type, every pool has three main holding areas for steelhead; the white water head which hold about 10% of the fish, the main pool which holds about 30% of the fish, and the tailout which will hold 60% or more of the fish. Choosing that special fly for that special fish in that special river! But, there are additional subtle holding areas which should be evident when a pool is analyzed. One is the inner slack area caused by a deep depression immediately following the pool head and slanting towards one side. Usually this is an obvious area because of the finer stream bottom material of silt and sand. Another common area is the big rock slick, an area resulting from one or more large boulders in the pool. Yet another is a bank root or log edge, which results from streamside undermining. A further area is a deep 'V' midstream slot caused by sloping instream gravel beds. One final area is a pocket pool caused by boulders wearing on sandstone stream bottoms. While the pools are the obvious holding water for steelhead there are also other areas in every river that act as resting areas. One such area is the large rock or stump that sits midstream. Water hydrology creates deep water on either side of this rock or stump and it is here that steelhead will often rest. As well, the whitewater immediately downstream from the rock or stump will have a soothing slick which washing evenly on either side of a holding steelhead. Any root, rock or stick which is imbedded in the riverbottom is prime steelheading holding water and should never be passed by. A fallen tree leaning downstream on the bank of the river also creates a soothing slick and shelter for resting steelhead. It is uncanny how that leaning fallen tree actually points to resting steelhead. A canopy of overhanging trees or brush on a riverbank provides steelhead with a feeling of shelter and security even in the shallowest of waters. If the water has color from upstream silt run-off then these shallow waters are excellent holding water. Black and pink are the author�s favourite colors for both summer and winter steelhead fly fishing. 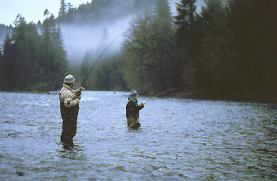 All steelhead flyfishers need a plan for fly fishing each section of water. In general I start my flyfishing at the head of the pool so I can work my drifts downstream in a manner that will not spook fish but rather entice them. I will, if necessary, wade across the stream to be on the best casting side before I start. Steelhead are resting fish when they have returned to their home river to spawn and I must present my fly immediately in front of a fish if he is to strike. If the fly drifts too high, or, too low, or, if the fly travels/swings too fast, there will be no strike. My presentation must be perfect for these very selective fish and, even then, I know that the odds are that the fish will not strike. 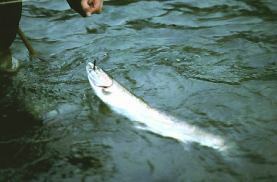 I have found it necessary, particularly for winter steelhead, to use a fast sinking wet-tip line. A wet-tip line fished with short two to three foot leaders gives the best presentation for my flies. When you are dry fly fishing, it is easy to watch your fly, to see how it performs as it drifts, skates, or swings across the pool. This fly movement is just as important for the wet fly fisherman and must be visualized and understood to develop confidence in your underwater offering. For the flyfisher there is an appeal with this tackle that defies explanation and which culminates in a personal euphoria when a fish strikes, that nectar of steelhead flyfishing! 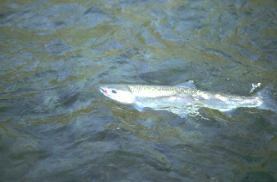 Fishing with a fly for steelhead is a challenge which only the flyfisher can appreciate. Without question other tackle is infinitely more effective for these non-feeding fish. But, for the flyfisher, there is an appeal with this tackle that defies explanation and which culminates in a personal euphoria when a fish strikes, that nectar of steelhead flyfishing!